As you have learned, ions are atoms or molecules bearing an electrical charge. A cation (a positive ion) forms when a neutral atom loses one or more electrons from its valence shell, and an anion (a negative ion) forms when a neutral atom gains one or more electrons in its valence shell. Compounds composed of ions are called ionic compounds (or salts), and their constituent ions are held together by ionic bonds: electrostatic forces of attraction between oppositely charged cations and anions. The properties of ionic compounds shed some light on the nature of ionic bonds. Ionic solids exhibit a crystalline structure and tend to be rigid and brittle; they also tend to have high melting and boiling points, which suggests that ionic bonds are very strong. Ionic solids are also poor conductors of electricity for the same reason—the strength of ionic bonds prevents ions from moving freely in the solid state. Most ionic solids, however, dissolve readily in water. Once dissolved or melted, ionic compounds are excellent conductors of electricity and heat because the ions can move about freely. Neutral atoms and their associated ions have very different physical and chemical properties. Sodium atoms form sodium metal, a soft, silvery-white metal that burns vigorously in air and reacts explosively with water. Chlorine atoms form chlorine gas, Cl2, a yellow-green gas that is extremely corrosive to most metals and very poisonous to animals and plants. The vigorous reaction between the elements sodium and chlorine forms the white, crystalline compound sodium chloride, common table salt, which contains sodium cations and chloride anions ([link]). The compound composed of these ions exhibits properties entirely different from the properties of the elements sodium and chlorine. Chlorine is poisonous, but sodium chloride is essential to life; sodium atoms react vigorously with water, but sodium chloride simply dissolves in water. Binary ionic compounds are composed of just two elements: a metal (which forms the cations) and a nonmetal (which forms the anions). For example, NaCl is a binary ionic compound. We can think about the formation of such compounds in terms of the periodic properties of the elements. Many metallic elements have relatively low ionization potentials and lose electrons easily. These elements lie to the left in a period or near the bottom of a group on the periodic table. Nonmetal atoms have relatively high electron affinities and thus readily gain electrons lost by metal atoms, thereby filling their valence shells. Nonmetallic elements are found in the upper-right corner of the periodic table. As all substances must be electrically neutral, the total number of positive charges on the cations of an ionic compound must equal the total number of negative charges on its anions. The formula of an ionic compound represents the simplest ratio of the numbers of ions necessary to give identical numbers of positive and negative charges. For example, the formula for aluminum oxide, Al2O3, indicates that this ionic compound contains two aluminum cations, Al3+, for every three oxide anions, O2− [thus, (2 +3) + (3 –2) = 0]. It is important to note, however, that the formula for an ionic compound does not represent the physical arrangement of its ions. It is incorrect to refer to a sodium chloride (NaCl) “molecule” because there is not a single ionic bond, per se, between any specific pair of sodium and chloride ions. The attractive forces between ions are isotropic—the same in all directions—meaning that any particular ion is equally attracted to all of the nearby ions of opposite charge. This results in the ions arranging themselves into a tightly bound, three-dimensional lattice structure. Sodium chloride, for example, consists of a regular arrangement of equal numbers of Na+ cations and Cl– anions ([link]). The atoms in sodium chloride (common table salt) are arranged to (a) maximize opposite charges interacting. 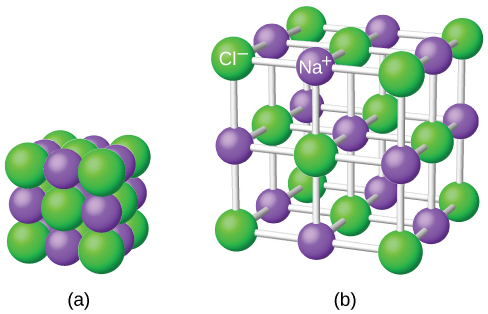 The smaller spheres represent sodium ions, the larger ones represent chloride ions. In the expanded view (b), the geometry can be seen more clearly. Note that each ion is “bonded” to all of the surrounding ions—six in this case. When forming a cation, an atom of a main group element tends to lose all of its valence electrons, thus assuming the electronic structure of the noble gas that precedes it in the periodic table. For groups 1 (the alkali metals) and 2 (the alkaline earth metals), the group numbers are equal to the numbers of valence shell electrons and, consequently, to the charges of the cations formed from atoms of these elements when all valence shell electrons are removed. For example, calcium is a group 2 element whose neutral atoms have 20 electrons and a ground state electron configuration of 1s22s22p63s23p64s2. When a Ca atom loses both of its valence electrons, the result is a cation with 18 electrons, a 2+ charge, and an electron configuration of 1s22s22p63s23p6. The Ca2+ ion is therefore isoelectronic with the noble gas Ar. For groups 12–17, the group numbers exceed the number of valence electrons by 10 (accounting for the possibility of full d subshells in atoms of elements in the fourth and greater periods). Thus, the charge of a cation formed by the loss of all valence electrons is equal to the group number minus 10. For example, aluminum (in group 13) forms 3+ ions (Al3+). Exceptions to the expected behavior involve elements toward the bottom of the groups. In addition to the expected ions Tl3+, Sn4+, Pb4+, and Bi5+, a partial loss of these atoms’ valence shell electrons can also lead to the formation of Tl+, Sn2+, Pb2+, and Bi3+ ions. The formation of these 1+, 2+, and 3+ cations is ascribed to the inert pair effect, which reflects the relatively low energy of the valence s-electron pair for atoms of the heavy elements of groups 13, 14, and 15. Mercury (group 12) also exhibits an unexpected behavior: it forms a diatomic ion, (an ion formed from two mercury atoms, with an Hg-Hg bond), in addition to the expected monatomic ion Hg2+ (formed from only one mercury atom). Transition and inner transition metal elements behave differently than main group elements. Most transition metal cations have 2+ or 3+ charges that result from the loss of their outermost s electron(s) first, sometimes followed by the loss of one or two d electrons from the next-to-outermost shell. For example, iron (1s22s22p63s23p63d64s2) forms the ion Fe2+ (1s22s22p63s23p63d6) by the loss of the 4s electron and the ion Fe3+ (1s22s22p63s23p63d5) by the loss of the 4s electron and one of the 3d electrons. Although the d orbitals of the transition elements are—according to the Aufbau principle—the last to fill when building up electron configurations, the outermost s electrons are the first to be lost when these atoms ionize. When the inner transition metals form ions, they usually have a 3+ charge, resulting from the loss of their outermost s electrons and a d or f electron. There are at least 14 elements categorized as “essential trace elements” for the human body. They are called “essential” because they are required for healthy bodily functions, “trace” because they are required only in small amounts, and “elements” in spite of the fact that they are really ions. Two of these essential trace elements, chromium and zinc, are required as Cr3+ and Zn2+. Write the electron configurations of these cations. Potassium and magnesium are required in our diet. Write the electron configurations of the ions expected from these elements. Most monatomic anions form when a neutral nonmetal atom gains enough electrons to completely fill its outer s and p orbitals, thereby reaching the electron configuration of the next noble gas. Thus, it is simple to determine the charge on such a negative ion: The charge is equal to the number of electrons that must be gained to fill the s and p orbitals of the parent atom. Oxygen, for example, has the electron configuration 1s22s22p4, whereas the oxygen anion has the electron configuration of the noble gas neon (Ne), 1s22s22p6. The two additional electrons required to fill the valence orbitals give the oxide ion the charge of 2– (O2–). Selenium and iodine are two essential trace elements that form anions. Write the electron configurations of the anions. Write the electron configurations of a phosphorus atom and its negative ion. Give the charge on the anion. Atoms gain or lose electrons to form ions with particularly stable electron configurations. The charges of cations formed by the representative metals may be determined readily because, with few exceptions, the electronic structures of these ions have either a noble gas configuration or a completely filled electron shell. The charges of anions formed by the nonmetals may also be readily determined because these ions form when nonmetal atoms gain enough electrons to fill their valence shells. The protons in the nucleus do not change during normal chemical reactions. Only the outer electrons move. Positive charges form when electrons are lost. Iron(III) sulfate [Fe2(SO4)3] is composed of Fe3+ and ions. Explain why a sample of iron(III) sulfate is uncharged. P, I, Cl, and O would form anions because they are nonmetals. Mg, In, Cs, Pb, and Co would form cations because they are metals. Ionic Bonding by OpenStaxCollege is licensed under a Creative Commons Attribution 4.0 International License, except where otherwise noted.